Free day-use passes are limited and available first-come, first-served based on each park’s capacity. San Francisco, Calif. (November 1, 2017) — Save the Redwoods League and California State Parks have collaborated for the third consecutive year, now offering free day-use admission to more than 40 redwood state parks on November 24, 2017, the day after Thanksgiving. This event promotes the enjoyment and appreciation of California’s state trees and the state parks that protect these magnificent forests. 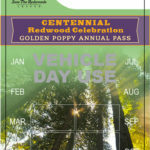 Thanks to the support of generous Save the Redwoods League members, more than 2,500 free vehicle day-use passes will be available for participating redwood state parks. The passes cover day-use admission and parking fees. Passes are available on a first-come, first-served basis at RedwoodsFriday.org beginning today at 8 a.m. Some of the parks include Big Basin Redwoods State Park, Calaveras Big Trees State Park and Armstrong Redwoods State Natural Reserve. Passes are limited. They will be distributed on a first-come, first-served basis according to each park’s capacity. To ensure valid entry and avoid fines, printed passes must be presented to park staff members at entry gates or displayed on vehicle dashboards if no personnel are on duty. We encourage all park visitors to review and obey park rules (external link). Share your experiences with us on social media using the hashtags #RedwoodsFriday and #CAStateParks. For detailed information, including a full list of participating state parks, park operating hours and outdoor safety tips (external link), please visit RedwoodsFriday.org. California State Parks invites the public to enjoy state parks year-round. With 280 park units, over 340 miles of coastline, 970 miles of lake and river frontage, 15,000 campsites and 4,500 miles of trails, the state park system provides wonderful recreational, educational and inspirational opportunities for more than 68 million visitors annually. Editors, please note: Free guides and brochures are available at RedwoodsFriday.org. B-roll of redwood state park images may be accessed on the site’s newsroom page. For more information, go to RedwoodsFriday.org. One of the nation’s oldest conservation organizations, Save the Redwoods League has been protecting and restoring redwood forests since 1918, connecting generations of visitors with the beauty and serenity of the redwood forest. Our 17,000 supporters have enabled the League to protect more than 200,000 acres of irreplaceable forests in 66 state, national and local parks and reserves. For more information, go to SaveTheRedwoods.org. The California Department of Parks and Recreation provides for the health, inspiration and education of the people of California by helping to preserve the state’s extraordinary biological diversity, protecting its most valued natural and cultural resources, and creating opportunities for high-quality outdoor recreation. Off-highway motor vehicle recreation, boating activities, horseback riding, on- and off-road cycling, hiking, camping, and rock climbing are some of the recreational activities enjoyed in 280 state parks organized into 22 field districts throughout the state. Visit us at parks.ca.gov. University of California, Davis, John Hopkins University and Save the Redwoods League today announced an ambitious plan to fully sequence the coast redwood and giant sequoia genomes — for the first time — utilizing conifer genetic sequencing techniques unavailable until now.